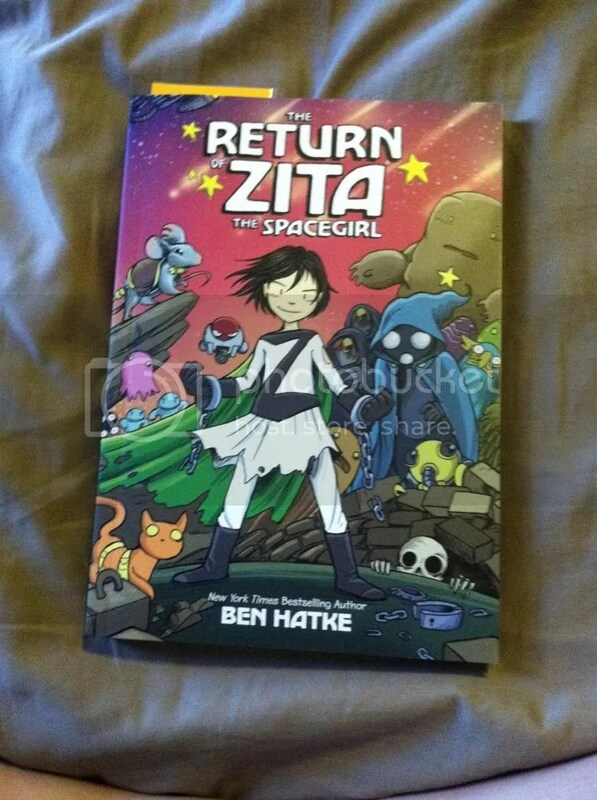 The Return of Zita the Spacegirl is available here. Overview: We open to Zita, a human girl of elementary school age, on trial for destroying an asteroid, stealing a spaceship, and interfering with the migration habits of an endangered species (All of these done in pursuit of good). Zita is sentenced to imprisonment and to working in the mines searching for a crystal that her warden will use to invade Earth and takeover. Zita must escape and defeat the warden before it’s too late and all of Earth is destroyed. The only way to do so will be to gather up her friends (quirky robots, some space pilots, and other animated objects) in order to save Earth. Zita is an intrepid young girl with an immutable sense of good, easily a great role model for young children. However, she is questioned about how her good acts may impact others. When she’s brought up on charges, we see that even though she has been doing good, there have been repercussions: potentially endangering others, theft, harming a species. Though it’s clear that Zita has done good, I think it’s also a good reminder that we can’t always foresee the ramifications of what we do, but that thinking them through is still a necessity. The humor is in the tradition of both traditional superhero stories and web comics. It’s nothing a younger child couldn’t understand, but it also appeals to a broader audience that includes adults. Zita also has a focus on teamwork and collaboration with adults that I think is awesome. It’s not uncommon to see television shows and comics that downplay the role of adults and teamwork in a successful endeavor. Zita features a cast of characters that help her that includes two adults who, unlike many stories, are not blundering fools or overwhelmingly suffocating for the main character. Instead, the supporting characters are valuable and fun to meet and watch. The artwork in Zita is great. It features striking contrasted colors, high color saturation, and design that draws on webcomic and more traditional comic traditions. 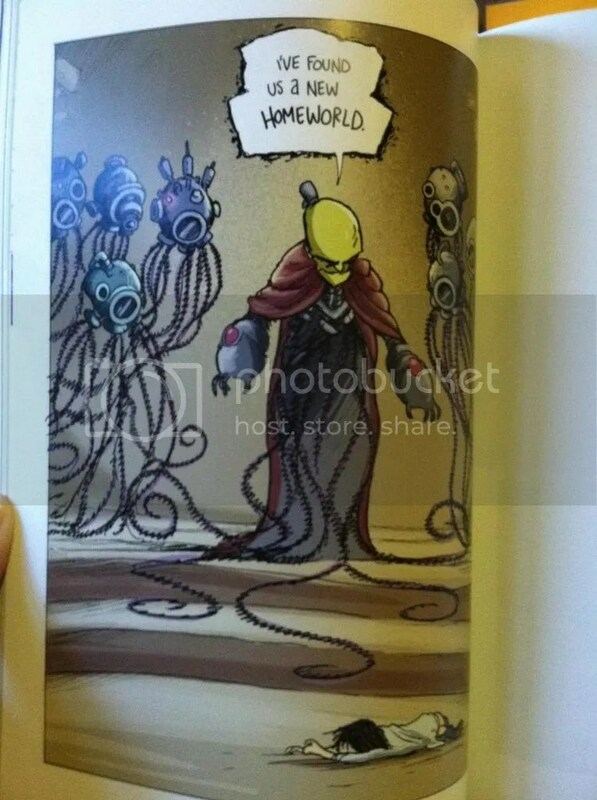 All photos in this post are creations of Ben Hatke. 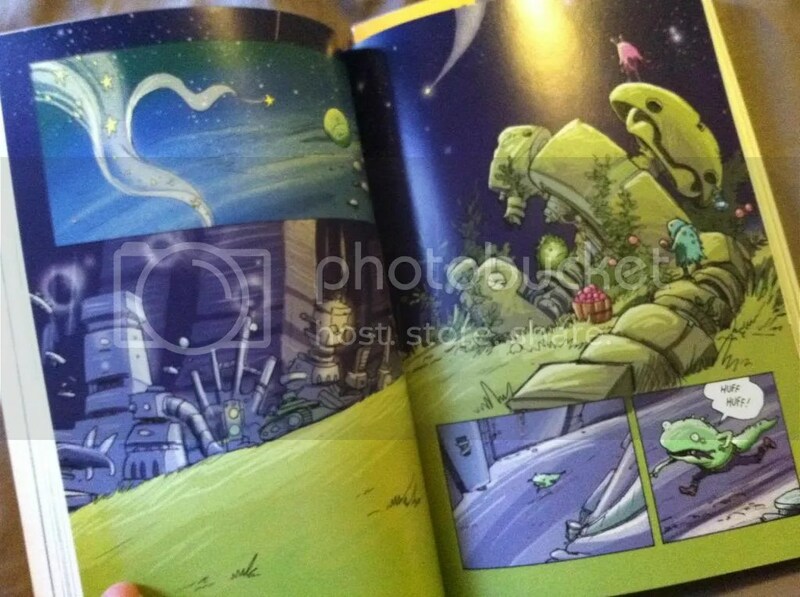 This entry was posted in Graphic Novels and tagged ben hatke, book reviews, Childrens, comic reviews, comics, Graphic Novels, Zita, Zita the Spacegirl.